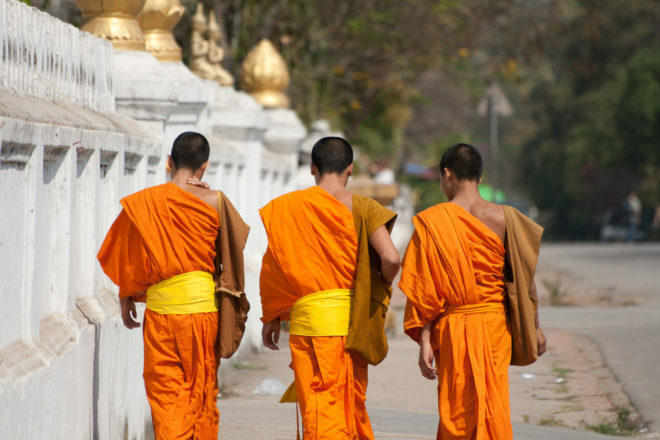 If you listen you will learn: The saffron robes worn by monks and novices brighten the streets of Laos, perhaps most famously in Luang Prabang - one of the oldest cities in Laos. All Lao boys are expected to become novice monks for at least three months of their lives, to bring spiritual merit to themselves and their family. Most come from impoverished, rural communities and move to larger towns to learn Buddhist values and gain a more superior education. You’ll always find a monk who wants to have a chat, if only to practice their English and find out about your hometown. They are always willing to share a bit of their way of life too. You will learn that novice monks take only ten vows, a very small percentage of the two hundred-odd vows that monks must take when they choose to make a lifetime commitment at the age of 20. You will learn how to distinguish between monks and novices by looking at the way they wear their robes (novice monks only cover one shoulder while a monk will cover both). And you will learn about the daily tak bat ritual where novices and monks walk silently around the streets at dawn for their daily alms collection. You just need to be still and listen. Water is a gift of nature: Despite being a landlocked country, Laos has no shortage of water, particularly during the rainy season. Whilst not the most aesthetically pleasing river in parts, the mighty Mekong is the artery to the nation's heart. On its windy, muddy banks, the country celebrates its major festivals as well as its day-to-day activities. But if you want to cool down, head to the turquoise waterfalls in Luang Prabang for a dip. During the rainy season, water tumbles over the limestone edges creating a series of cascading lagoons. You can swing like Tarzan off vines and jump from tree branches into the pools. Even if you don’t visit Laos during the rainy season, you can still swim at the Blue Lagoon or kayak along the Nam Song River in Vang Vieng. 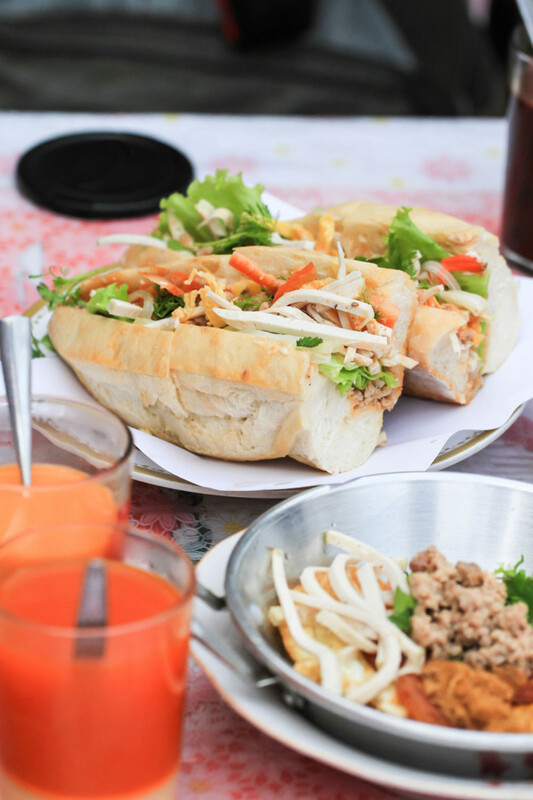 Amazing things can be found in the most unexpected places: Some say that Laos has the best croissants out of France. A legacy of the French ruling, it’s not uncommon to stumble upon an A-grade apple tarte tatin, frog soup, or street side vendors selling salad baguettes. In fact Vientiane, the capital city of Laos, is home to an impressive selection of French restaurants as well as a replica Arc de Triomphe, which has earned the city the title of (albeit rather generously) the Paris of the East. Mind you, traditional Laos cuisine is also fantastic and cheerfully cheap. You can't go wrong with phenomenal pho served at roadside shacks, spring rolls, larb or a street buffet. Peace and quiet is a welcome novelty in this age: Laos is one country where you’ll rarely be hassled. For anything. As any seasoned traveller can appreciate, this is a telling comment about the kind of place Laos is. Here you can walk the streets and browse shops in peace - your only trouble will be finding the shopkeeper to purchase something. In fact, Laos’ Wattay International Airport is possibly the only airport in the world where you have to approach the taxi driver. Lesser-known but no less beautiful than Southeast Asia’s tourism trifecta (Thailand, Vietnam, Cambodia), Laos is the region’s quiet achiever filled with some insightful life lessons to impart, says Ainslee Harvey. Sandwiched between Thailand, Myanmar, China, Vietnam and Cambodia, Laos is arguably the heart and soul of Southeast Asia, in more ways than one. Despite its quiet demeanour and underrated appeal, Laos combines some of the best elements of Southeast Asia in one rather small destination. 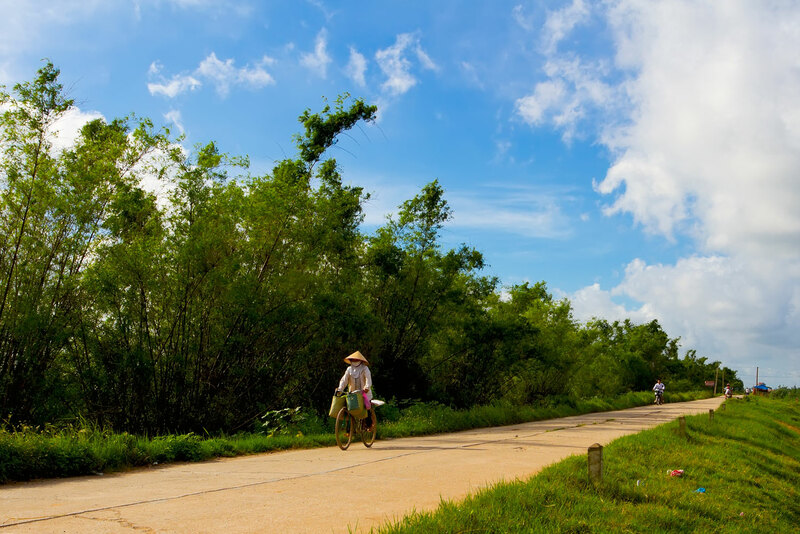 Best known for its Buddhism and contemplative nature, Laos was best summed up by the French (the country’s former colonial masters) when they observed the Vietnamese plant rice, the Cambodians tend the rice, and the Lao listen to it grow. Laos is one country where you’ll rarely be hassled. For anything. As any seasoned traveller can appreciate, this is a telling comment about the kind of place Laos is. Here you can walk the streets and browse shops in peace – your only trouble will be finding the shopkeeper to purchase something. In fact, Laos’ Wattay International Airport is possibly the only airport in the world where you have to approach the taxi driver. Some say that Laos has the best croissants out of France. A legacy of the French ruling, it’s not uncommon to stumble upon an A-grade apple tarte tatin, frog soup, or street side vendors selling salad baguettes. In fact Vientiane, the capital city of Laos, is home to an impressive selection of French restaurants as well as a replica Arc de Triomphe, which has earned the city the title of (albeit rather generously) the Paris of the East. Mind you, traditional Laos cuisine is also fantastic and cheerfully cheap. You can’t go wrong with phenomenal pho served at roadside shacks, spring rolls, larb or a street buffet. Laos was heavily bombed by the United States during the Vietnam War. Heartbreakingly, to this day, many Laotians are killed or severely injured by the unexploded ordnances from the fierce air attacks. It is confronting to see the aftermath of the attacks on the streets today – young children confined to wheelchairs, men and women tackling daily tasks with severely mutilated limbs, others left blinded. Thankfully rehabilitation centres for both the harvesters of the unexploded bombs and those who have been injured have been set up to increase awareness and provide support for those requiring prosthetics, orthotics and general rehabilitation. Despite being a landlocked country, Laos has no shortage of water, particularly during the rainy season. Whilst not the most aesthetically pleasing river in parts, the mighty Mekong is the artery to the nation’s heart. On its windy, muddy banks, the country celebrates its major festivals as well as its day-to-day activities. 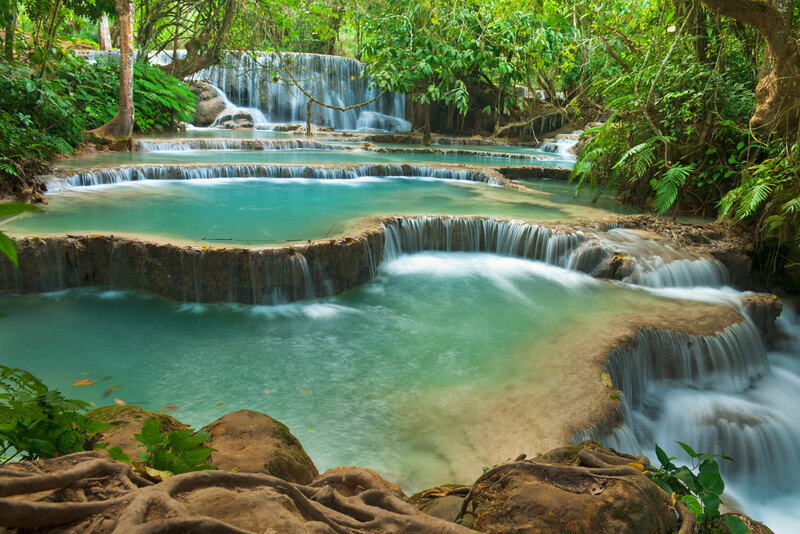 But if you want to cool down, head to the turquoise waterfalls in Luang Prabang for a dip. During the rainy season, water tumbles over the limestone edges creating a series of cascading lagoons. You can swing like Tarzan off vines and jump from tree branches into the pools. Even if you don’t visit Laos during the rainy season, you can still swim at the Blue Lagoon or kayak along the Nam Song River in Vang Vieng. The saffron robes worn by monks and novices brighten the streets of Laos, perhaps most famously in Luang Prabang – one of the oldest cities in Laos. All Lao boys are expected to become novice monks for at least three months of their lives, to bring spiritual merit to themselves and their family. Most come from impoverished, rural communities and move to larger towns to learn Buddhist values and gain a more superior education. You’ll always find a monk who wants to have a chat, if only to practice their English and find out about your hometown. They are always willing to share a bit of their way of life too. You will learn that novice monks take only ten vows, a very small percentage of the two hundred-odd vows that monks must take when they choose to make a lifetime commitment at the age of 20. You will learn how to distinguish between monks and novices by looking at the way they wear their robes (novice monks only cover one shoulder while a monk will cover both). And you will learn about the daily tak bat ritual where novices and monks walk silently around the streets at dawn for their daily alms collection. You just need to be still and listen.